Back in April, the family of Pakistan’s scandal-plagued prime minister landed in the crosshairs of an investigation relating to the leaked Panama Papers. This week, the team handling the investigation concluded that documents signed by Prime Minister Nawaz Sharif’s family were fraudulent due to the fact that they were purportedly from 2006 but used Microsoft’s Calibri font, which wasn’t publicly released until 2007. When the Panama Papers were first leaked last year, many wealthy and powerful people were exposed for activities involving the sheltering of large amounts of money overseas. Three of Sharif’s children, including his heir-apparent Maryam Sharif, were included in the data dump. The documents showed that the children had offshore companies and assets that were not reported on the family’s financial disclosures. For two months, a Joint Investigation Team (JIT) investigated the Sharif’s finances. Because of that tiny font choice, they concluded that some documents were falsified in an effort to hide income. Uncertainty remains, however, about whether the person who prepared the documents really could have had a copy of Calibri in 2006. We know that the typeface was officially released to the public and became the default font for Microsoft PowerPoint, Excel, Outlook, and WordPad in 2007. But there’s some confusion about how available it was before that. A Microsoft representative told Gizmodo that the company’s internal system showed the font was available in a pre-release form going all the way back to 2004, but they were unable verify that date, asking us to reach out to another contact. We’ll update this post if and when we hear back. That information aligns with font consultant Thomas Phinney’s comments on the matter. Phinney claims that Calibri was first available “outside Microsoft in a Windows beta release on 9 August 2004.” When Phinney noticed that people were using his post about the font’s history as a source for the story involving the Sharif family, however, he added some clarification. “Be aware that pre-release versions of Windows are not generally used for typical office documents; just because it is physically possible that Calibri could be in a random document dated to 2006 does not make it at all likely,” wrote Phinney. According to Microsoft’s website, version 1.0 of Calibri was copyrighted in 2005. Early Windows betas are intended for programmers and technology freaks to see what works and what doesn’t... As the file size of such operating systems is huge, it would have been a serious effort to get. All of this confusion has spilled over onto Calibri’s Wikipedia page (which had to shut down edits), but, ultimately, the dates may not matter. The investigative team claims to have found “numerous” anomalies in the Sharif family’s records. And, let’s be honest, what else are Panamanian shell companies used for? Whatever evidence the JIT ultimately brings against Sharif’s family, the font has been the juiciest detail, becoming a rallying cry of social media users using the hashtag #Fontgate. 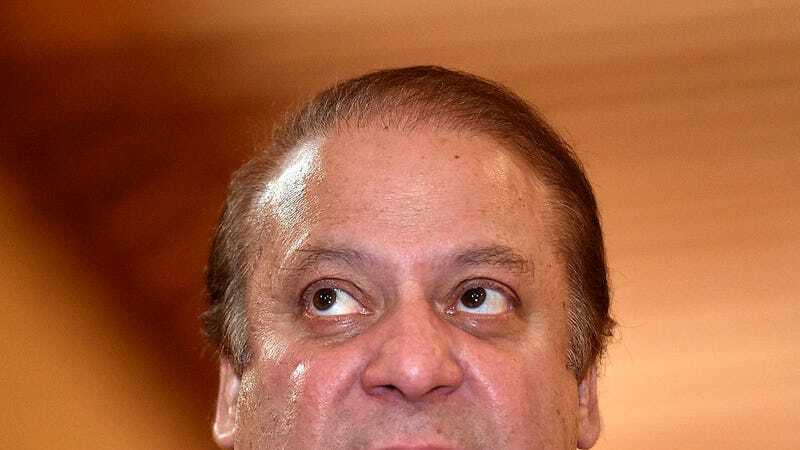 Before you start thinking Pakistani politics are so much different than our own, consider the fact that Sharif is in trouble because of his dumb kids and that those calling for his ouster are using a silly hashtag. Consider the fact that when the papers first leaked, Sharif called them fake news drummed up by people “targeting me and my family for their political aims.” Consider the fact that opposition leader Imran Khan said that this investigation shows Sharif has “lost all moral authority” and he should resign. Consider the fact that Sharif’s fellow leaders in government held a meeting and later “expressed complete confidence in the leadership of the prime minister.” Yeah. Meanwhile, Pakistan’s markets are reeling with uncertainty and its supreme court will have to decide whether a trial is warranted.